Just a quick one today folks. 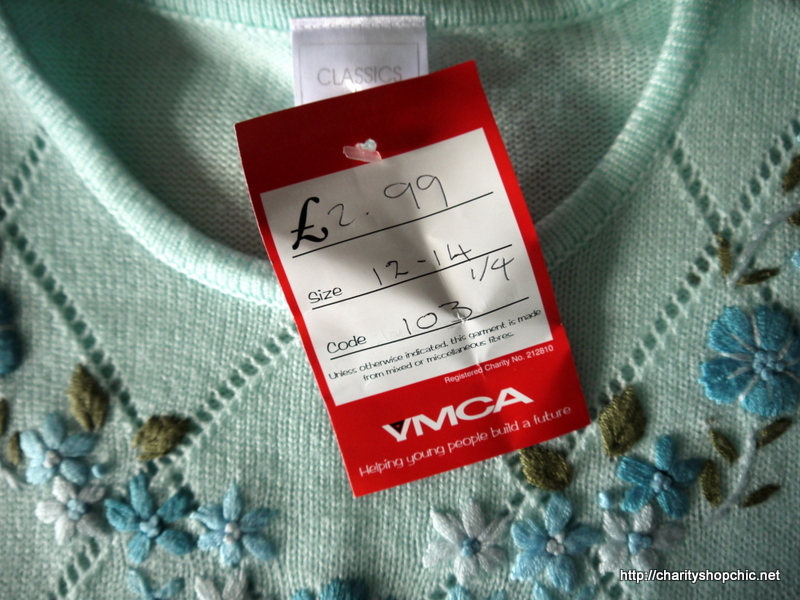 I’d like to tell you about this rather ugly jumper that I bought from the YMCA shop in Middlesbrough for £2.99. 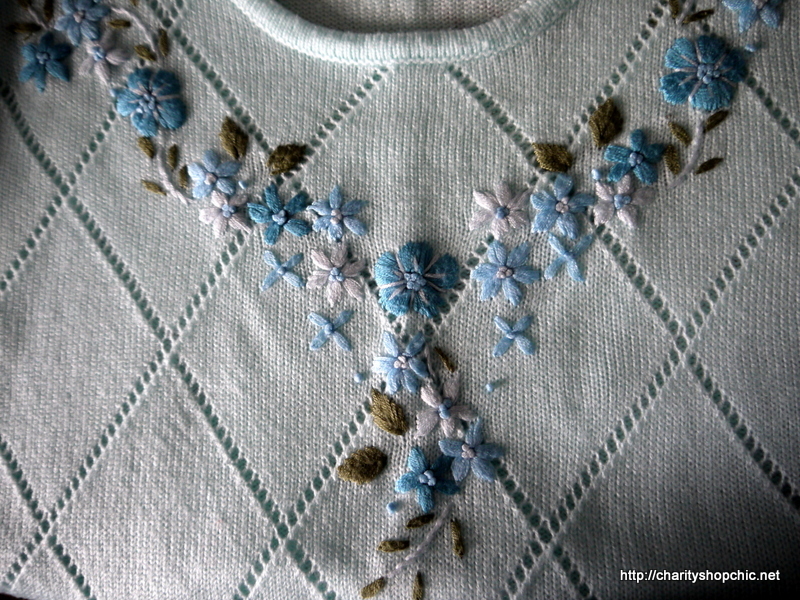 The overall shape is very ‘old lady’, and there isn’t a natural fibre in sight, but it has a pretty embroidered section around the neck in shades of blue and green. 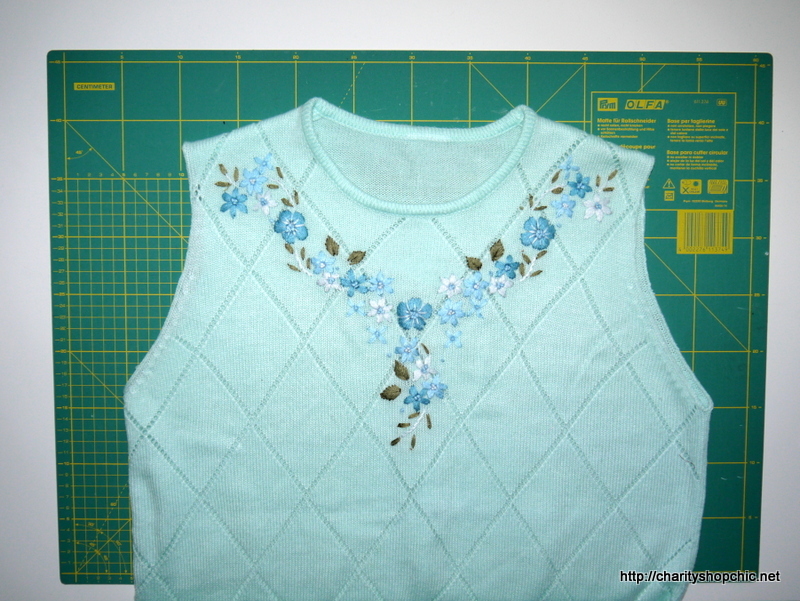 Happily, because the jumper was assembled as individual pieces, it meant that the armholes didn’t require finishing. I also took in the sides, overlocking the new side seams to prevent unravelling. 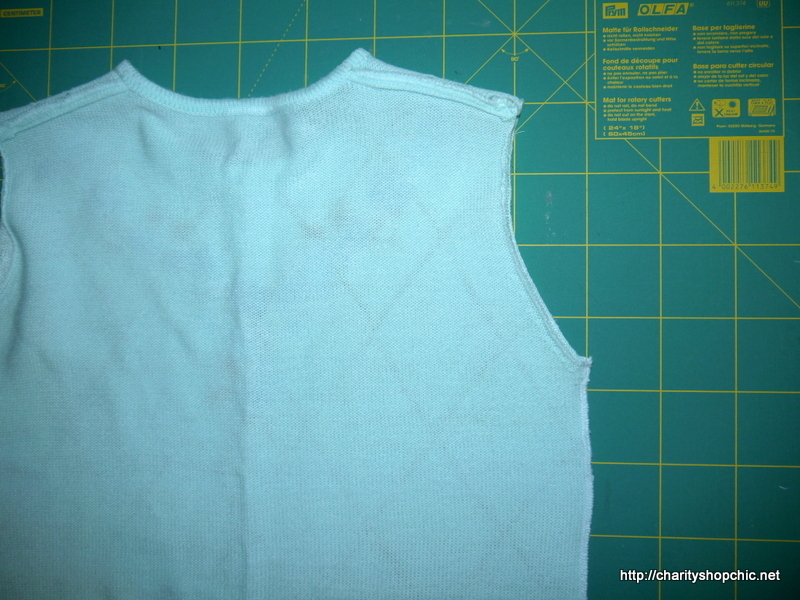 The result is a blue tank top. Take note, Americans; in Britain this is the only type of garment that can be called a tank top. Specifically, it’s a sleeveless jumper. The kind of thing you’d call a ‘sweater vest’. Since completing this project last summer I have worn it loads. I wear it over long and short sleeve shirts with a collar, and it’s great for spring/autumn when the weather is kind of transitional – a good alternative to jackets. Although it’s October, temperatures are still in the 20s here. The below outfit gives you a good idea of how I have been wearing this. I’m wearing a charity shop men’s dress shirt that I bought on a trip to Upminster, Essex – sorry, I thought I had a picture of the original label for you, but I don’t. This has been a wardrobe staple for a year or two. I only wear it under jumpers because the body is too big, and the sleeves are rolled up because they’re too long, but… I still love it. I love wearing a men’s dress collar, maybe that’s just me. It never occurred to me to resize the shirt because it sort of works the way it is, but I suppose it’s possible I will make it fit better in the future. For that to happen it would have to come out of regular rotation for a while, and… well that’s not going to happen. Anyway, I digress. 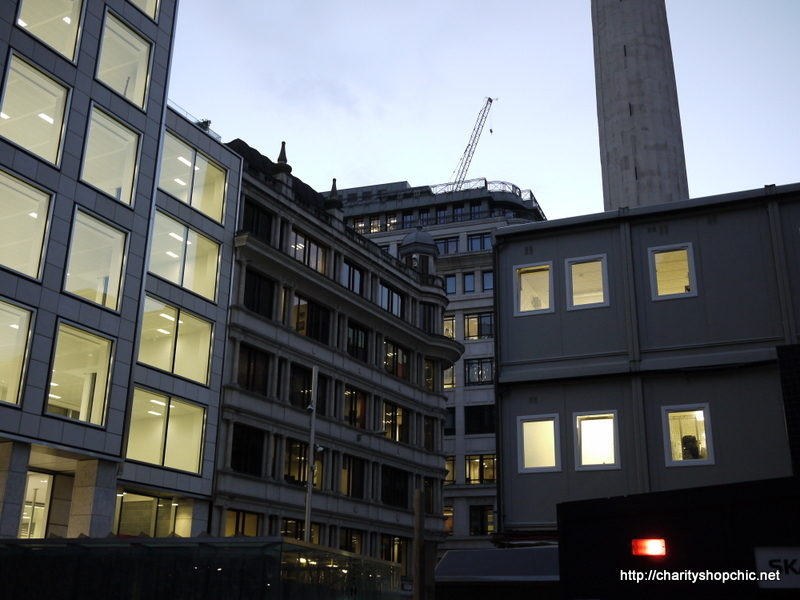 We took some pictures on the way out to dinner near Pudding Lane, London. 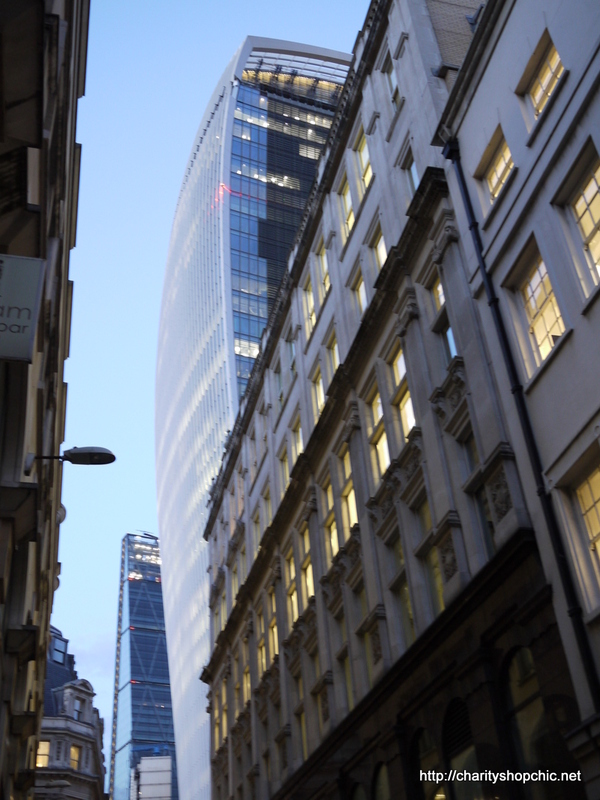 History buffs, this is where the Great Fire of London started in 1666, which burnt down practically the whole city! There is a Monument marking the spot which is a really tall column with a golden orb at the top. 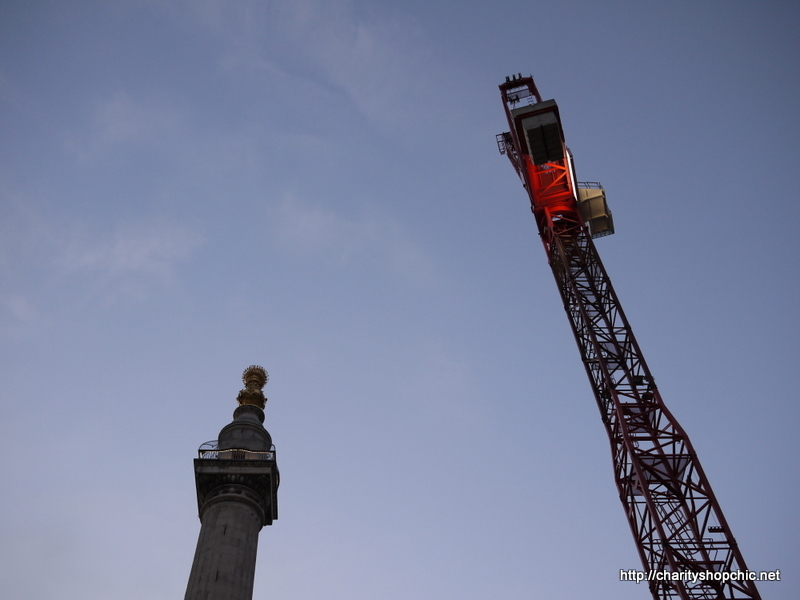 Unfortunately the whole area surrounding the monument is under construction at the moment, but we managed to take some pictures anyway. Enjoy! 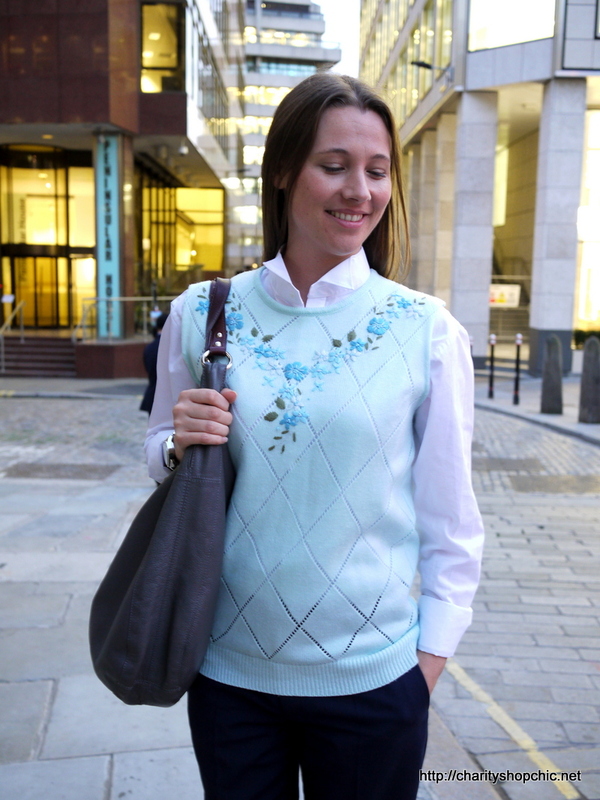 Superb-such a simple fix, but a great result-I will start looking at old lady style jumpers with a different eye now! Thanks for your inspiration! Thanks for reading! Yes, such a simple job but that embroidery was worth saving! Hi Juliana! I am sure there are a lot of pieces from your mother’s wardrobe that you can wear, with a few tweaks. Some items may not need much, perhaps a change of hem length, to look more current, but it’s worth doing to preserve the memories! Good luck! Wow! 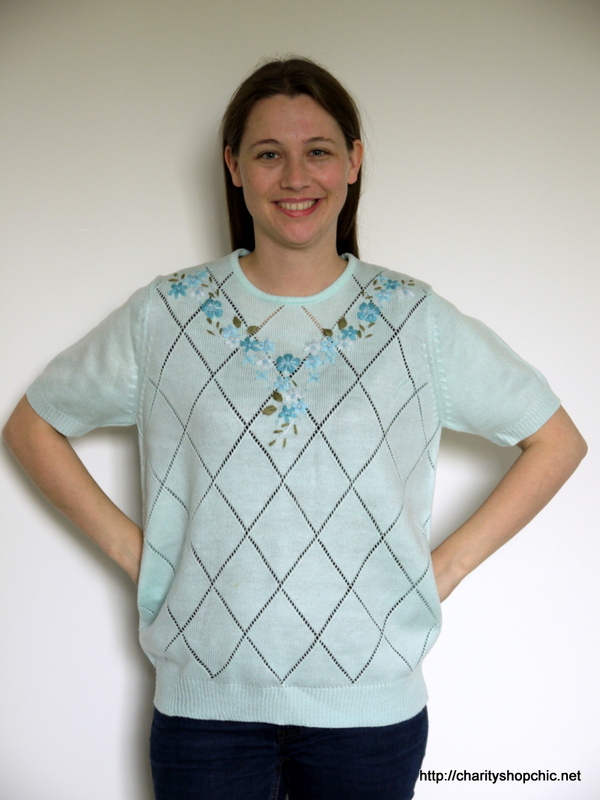 I did not think you could rescue this, but when I saw the first picture of it refashioned I exclaimed out loud, “So cute!” It looks great with that blouse. You certainly have an eye for diamonds in the rough!! Thanks, MJ! I have worn this quite a lot actually, it’s quite a useful piece. The embroidery certainly caught my eye in the shop, I’m glad I picked it up! You are by far my favorite refashion blogger!! Some others do a fine job, but you are so creative, talented, and you do cute and realistic refashions. I am young, but I cannot wear these strapless refashions that are so easy to do. Many get by on strapless creations, or by being super skinny. Your refashions are actually wearable and would look good on many people. You are very inspiring. Good for you! I hope you do really well in life and with people, whatever you do!! Well, that is very kind of you to say so MJ, I’m blushing! Personally, I’m not terribly comfortable in strapless things, mainly because it’s hard to find ones that fit me. And realistically, my day-to-day life doesn’t present me with many opportunities to wear strapless items. I do try to add depth and variety to my refashioning projects and am thankful that I have such appreciative readers :) Your support means a lot, thank you! As usual, a stunning and inspired refashion. Thank you for your support, Sue! Hi Sally! What a great find. 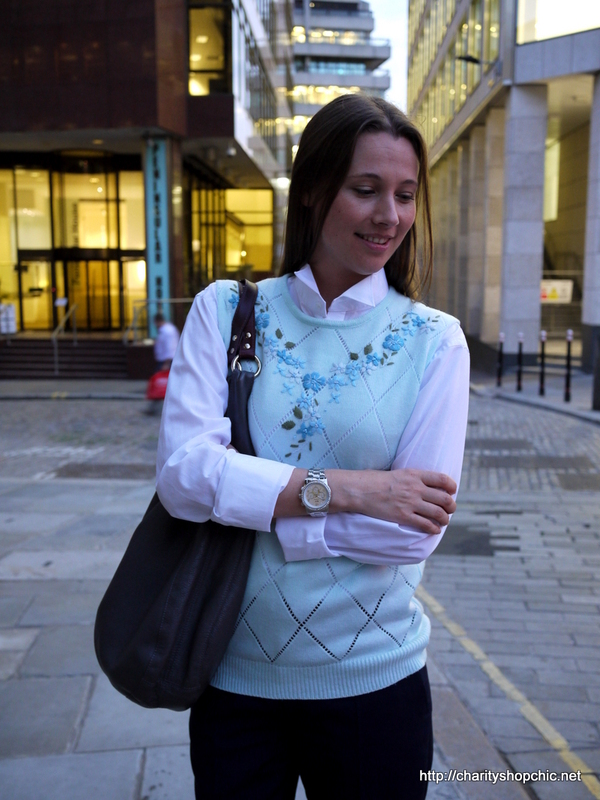 This was an excellent way to take this granny “jumper” and make it fashionable again. Kudos for your patience in unpicking! Thanks, Mary! It took a while to get rid of those sleeves but it was worth it to get the finished edge for the armhole. 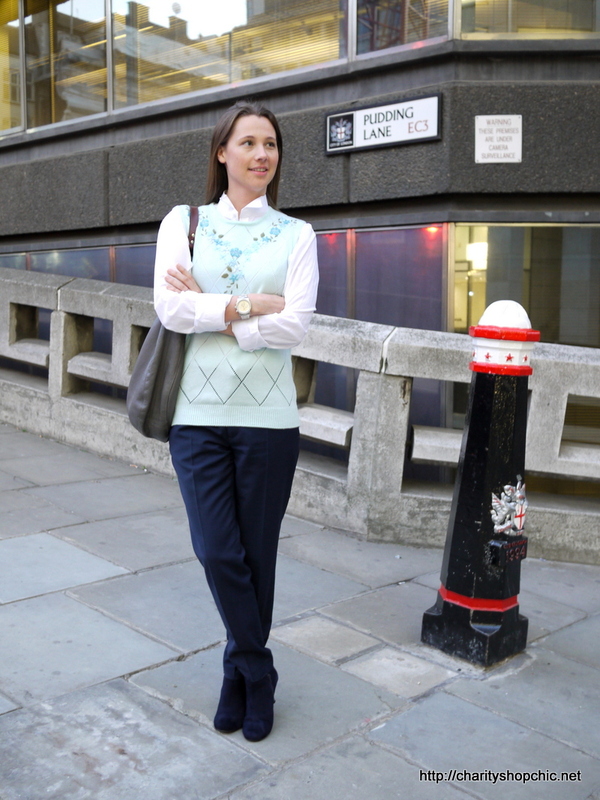 I never thought I could like a jumper that looks like it came from my mother’s wardrobe, great job! I guess one person’s trash is another person’s treasure! Thanks for commenting! What an amazing transformation! Fantastic tank top! Thank you so much, glad you liked it! So cute! I was just looking at the photos and thinking that Charity Shop “Chic” is a very suiting blog name. Everything you make is just so chic!!! Reading that over makes me realize how nerdy I sound haha, deal with it! HAHAHA not nerdy at all! Sleeveless T-shirts are called ‘vests’. 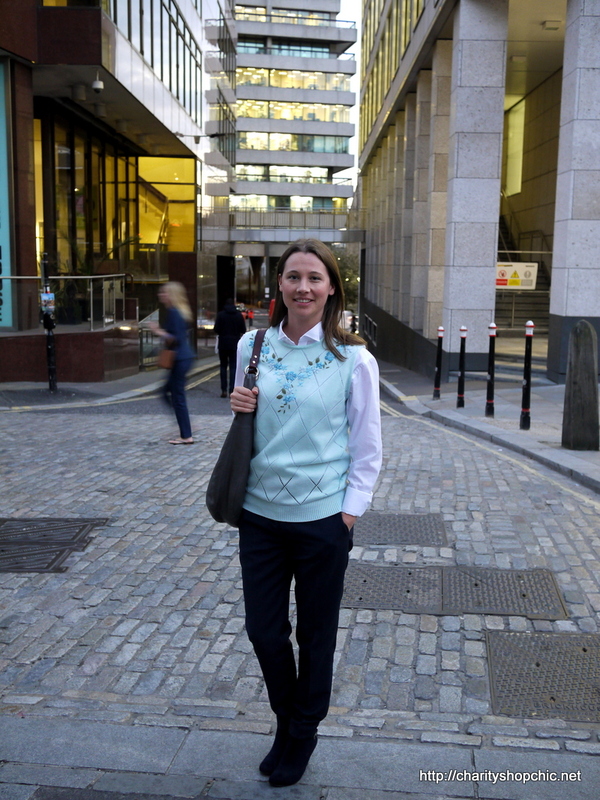 A sleeveless jacket (that you’d call a vest) is a waistcoat. If it was a sleeveless buttoned shirt/blouse, I’d probably just say shirt/blouse as well. OK, I’m working on it! What a super refashion! I saw it and thought, ooh, pretty details but unshapely and huge! You make it look gorgeous! The dress shirt is a super idea too! Ooh, what were you doing in Upminster?! 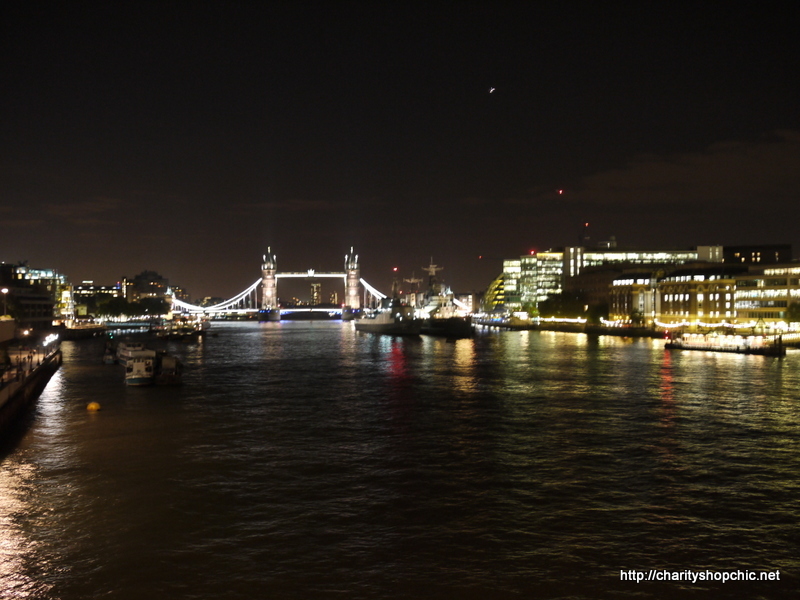 I was there yesterday, but at 1am in the morning getting the District line home as we’d missed the train! THANK YOU! I shall get a man’s dress shirt, there are loads of them in the chazzas here. 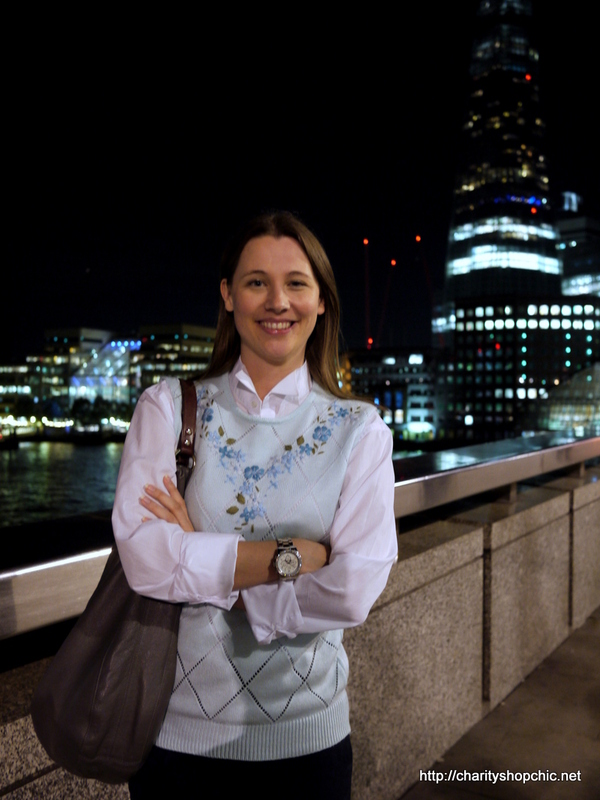 The tanky is lovely – I, am inspired! 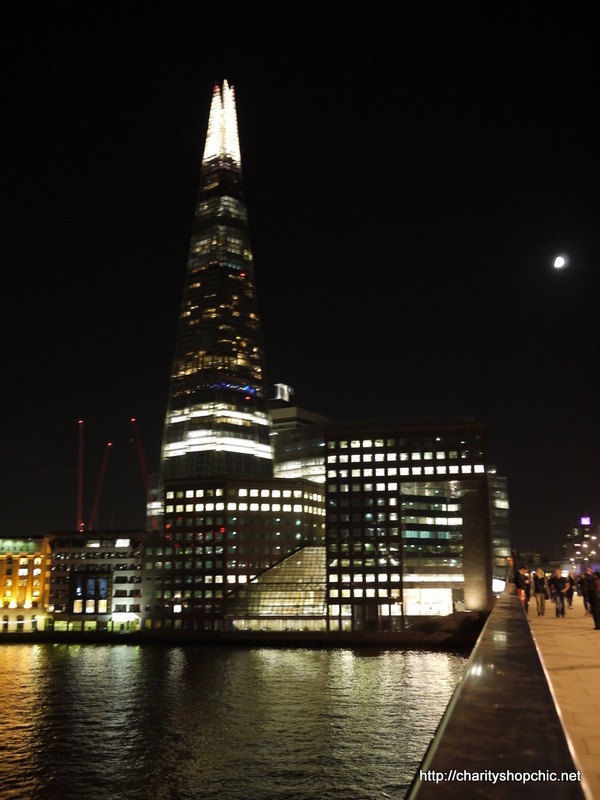 You’re welcome – thanks for reading! Hi Molly, thanks for the advice. I figured this might be possible, but couldn’t get it to work! I’ll definitely try this next time though, thanks! I really like the idea about ” Charity Shopping and Refashion”. People always buy a lot of new cloths before they think thoroughly whether they need them. Therefore, most of them are cast off. We are fighting for a sustainable fashion future, we should appeal people do some refashion work! It`s not only about how to “up cycling, it`s about “How do you design your life”! Well done, to take such a ‘hideous’ garment and make it into something pretty and wearable requires great vision. I must try harder next time I’m charity shopping. Thanks for the inspiration! You are welcome! Have fun charity shopping! I am a marketing student studying at Bournemouth University, currently conducting a sector intelligence report on Charity shops and Vintage Clothing. I think your blog is great. To inform my research, I was wondering if it’d be OK to involve your blog as a form of content for analysis in the report? This post is fantastic. You’ve really embraced the idea of clothing recycling and what Op-shops are actually about. Saving yourself money and sustaining the environment, great work. It would be fantastic if in time we could have a greater amount of people partaking in activity such as this, do you agree? Keep up the great work. 02/11/2014 - 6:04 pm ooobop! How would have thought that old lady sweater could look so new and fresh. I love it. Thanks! You are very kind. Thanks for reading.